Five Gadgets to Keep Your Workspace Organized | It's not your tech, it's how you use it. One of the biggest complaints I see when people post photos of their workspaces – usually tidied up a bit for the photo – is that some of the best ones, the most well put together and the most efficient looking ones, can’t possibly be a place where actual work gets done because they’re too neat, too elegantly put together, or too clean and well organized. It’s something of a tragedy and definitely a vicious cycle: people go looking around the Web for photos of beautiful workspaces, find them, and instead of taking ideas on how their workspace could look better or help them be more efficient, they’re angry that the workspaces in question don’t look more like the ones they already have: disheveled, unorganized, and in need of improvement. So the cycle begins again. At least until now. I’ll show you five items that I’ve found invaluable in keeping my workspace clean and clutter free – to the point where if I did a little dusting and took some photos, some people would think it’s impossible that I actually did any work there. Saying these are “gadgets” is a little bit of a Cheap Oakleys misnomer – they’re not all gadgets in the electronic sense where they have lights and buttons, touch-screens and batteries, but some of them will make sure that we steer clear of some the most common pitfalls most of us fall into when it comes to keeping our workspaces organized. Unless you want all of your bills, mail, and other “I need to pay attention to this on this date” items in a big stack next to the door, you’ll want one of these 31 Day Bill Organizers . 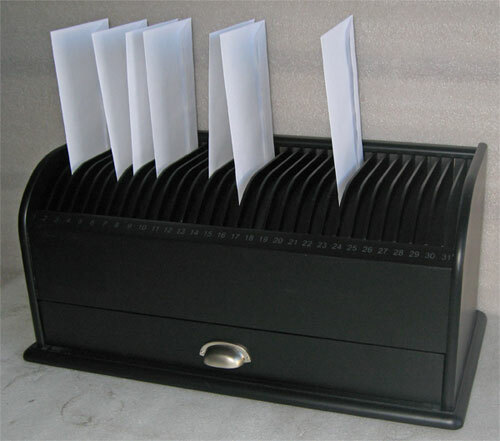 It’s one of the best things I’ve ever purchased when it comes to keeping paperwork in my household to an organized minimum. The 31 day bill organizer allows me to – as soon as a new bill arrives in the mail – drop it into the date slot on the organizer that corresponds to when it’s due, or at least when I want to pay it. Then with one glance at the bill organizer, I know if something is due today, or should be paid today. I never lose a bill, and I’m never late with a bill, but most importantly, the bill is never misplaced or stuck under a pile of other bills waiting to be paid. Between this and (another great suggestion) the recycling box I put next to the front door, hardly any paper mail goes misplaced in my apartment anymore. The junk goes right into the FOakleys recycling box, and the bills get opened and go right into the organizer immediately. Other things like statements get tossed into their respective folder in the filing cabinet (another great idea, but not necessarily for workspaces only) and that’s the end of that. On the other side though, if you don’t want to spend money on an organizer, you can always go paperless when it comes to your bills – your bank and most of the companies you pay on a regular basis for power, entertainment, and your credit card spending all allow you to do it. Some of them will even e-mail you before they take the money out, or let you schedule when the bill gets paid electronically – less paper in the first place means a more organized workspace. If you have a laptop – especially one that you take with you to and from the office, or that you keep with you at all times but open up and use when you get home, you probably want a docking station for it, or some other laptop stand or equivalent that gives it a nice home that’s easy to drop it in and take it out of. There’s nothing more frustrating than getting home with your laptop, pulling it out of your bag, and knowing you have to connect a half-dozen cables to it in order to get yourself up and running at home. Video, USB peripherals, network cables (if you’re not wireless, in which case I suggest you go wireless if you can,) power, you name it. One little docking station or at least a laptop stand with your commonly used cables zip-tied or velcroed to it (if you don’t feel like buying a docking station for your laptop’s make and model) can make a world of difference when you need to settle in and get some work done at your desk at home. Plus, you avoid the need to fish for cables, connect each one individually, and then try to keep them all orderly. Even if you don’t have a laptop, take the phrase to heart even with your desktop computer – you may not need to dock a system when you get home from the office, but you may want to connect your flash drive, external hard drive, phone, or other devices when you get home. Try to make sure you have a space in your workspace dedicated to those devices that get docked or connected when you get home from the office, instead of forcing yourself to clear a space every time you have something you want to put on your desk. Making sure everything has a specific place goes a long way towards staying organized. Most offices provide these to their employees, and there’s no reason you shouldn’t have one at home as well: a desk organizer with horizontal and upright sections for files and folders . If you don’t like the kind with more vertical sections than horizontal ones, that’s fine – you can always get a different desk organizer that suits your tastes . The point here is to give your paper a place to live that’s not all over the place and all over your desk. As soon as you start to accumulate piles of related paper, or folders of paper that are stacked on top of each other, you’re starting to lose the battle. 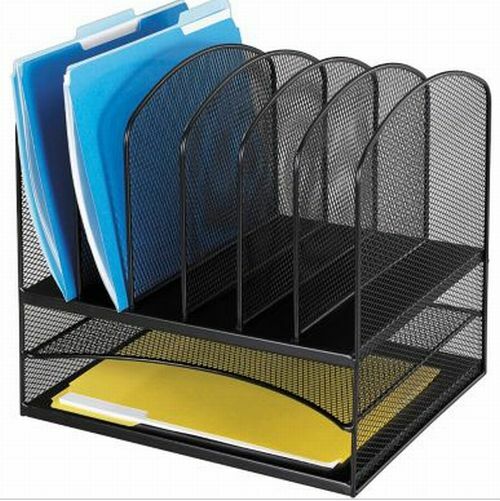 You would do well to have something – some kind of filing system that’s on your desk and easily available for the files that you use most frequently and most often, and a simple desk Cheap oakley outlet organizer like this one does the trick without breaking the bank or spending a ton of money. Plus, the black mesh look is kinda modern and sleek, don’t you think? Remember a little ways up there when I was discussing docking stations? The goal of having a docking station, or even a dedicated place for your computer peripherals where their cables can be easily traced and plugged in to your portable computer, is to reduce clutter from cables and plugs all over your desk and to reduce the amount of time required from you walking in the door with your gear to being productive when it’s time to work. So why not do the same thing with your existing gadgets, not just the ones that need to be plugged in to your computer? Cable management is probably one of the hottest topics when it comes to keeping a desk tidy – even some of the nicest workspaces can be pretty quickly spoiled by a rats nest of cables that would make it virtually impossible to swap out your mouse if it broke, or trace your video cable to its end if it fell down behind your desk. Personally, I like the Cordies Cable Organizers – they’re cheap, they’re small, and they fit right in on your desk. You can drop anything in them, from your headphone cables to the USB cable connecting your mouse to the back of your computer, and if you disconnect anything that’s run behind your desk or over to the wall, you’ll never lose the cable again. If you’re on a budget, try the Belkin Cable Dome – it’s cheaper, but just not as attractive and doesn’t support the same number of cables. Still – the Cable Dome could be a good complement to the cordies – you can drop one of these on the underside of your desk or on the wall next to your computer and run your cables through it.While you’re at it, why not tie the important ones together (charger and data for your phone, cables for your computer, cables for your laptop, etc) using Velcro Cable Ties ? See? Nice, neat, and tidy. Another thing you might consider is putting a small power strip or surge protector on the top of your desk. I know, I know, I hear it now – surge protectors are big and bulky and ugly. Well, not all of them! 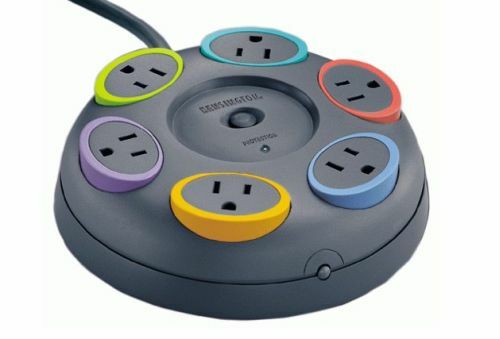 For example, how about this Kensington SmartSockets 6-outlet surge protector – the color coded plugs make it easy to tell what’s plugged in where, and the circular shape means it won’t look horribly out of place on top of a desk instead of covered in dust underneath it. Plug, the nice long cord attached to the surge protector makes an easy run from the top of your desk to an outlet. Another suggestion – although this would have to go into a nearby outlet unless you used an extension cord – is the Belkin Mini Surge Protector and Dual USB Charger that I simply refuse to leave the house on long trips without. Even if I’m away for a few days, this goes in my bag. If I had an outlet on the wall next to my desk and it were only two ports, this would live in one of them permanently. This is a bit of a gimme, since it’s not necessarily going to keep your clutter level or strewn papers or anything in their rightful homes, but it’s definitely something you want to keep around at all times if you want a generally clean workspace. 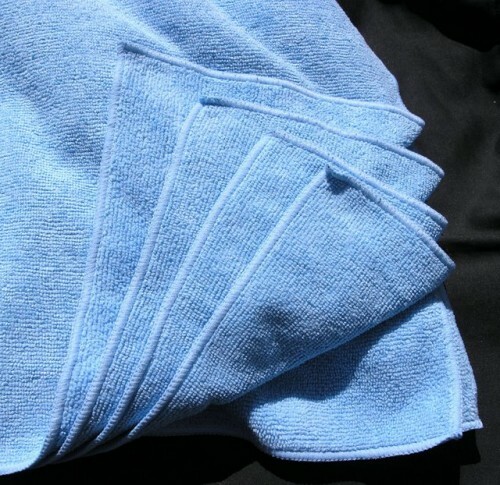 That’s right, the ultimate in screen and gadget cleaning gear, a set of Microfiber cleaning cloths . I like to keep one of these tiny Microfiber cloths on my keychain so I can get a good look at my phone’s display anytime it gets smudged up because I took a call, or because I just put moisturizer on my hands and had to check my e-mail. Sure sure, it’s not going to help you keep your cables in check, or make sure your display is at the optimal position, or save you time when you have to get to work, but I’ll say this: one of the first things to go when your workspace starts to get dirty is your sense of how clean it is. If you think your workspace is getting messy, it will get messy. When your monitor starts to get those little smudges on it because you were drinking tea and read your favorite webcomic, or because you were on the phone having a shouting match with someone and you want to clean them off, use these. If your laptop display is looking a little Cheap Oakley Sunglasses dusty, a quick swipe with a microfiber cloth will make it look like new again. Little things go a long way towards keeping your workspace looking sharp, clean, and like it belongs in pictures – and trust me, if you do the little things when you notice them, you won’t have to do the big things ever because you won’t let your workspace get that bad. Was that five? Okay, let’s make it six with this bonus item: an additional display. Those of you rocking more than one display already know what I’m talking about – those of you who are sitting in front of a computer with one display, even if it’s nice and big, or worse in front of a laptop perched on a desk, don’t know what you’re missing. I’ve written about this before, but it holds true now as much as ever. If you have enough screen real estate, multitaskng is easier – especially when your working on something that requires you to go back and forth between documents, views, or your work in one area and research in another. Need a use case? I’ll use myself – it’s clear I do a lot of writing (hit me up if you need a writer, of course!) but in the course of my writing I frequently do a lot of research and tab back and forth between the documents I’m composing and reference material that I use to either link my points or back up my statements. You know, like a good writer would! It helps a ton to be able to write on one display with minimal distraction on it, but if needed, bring up my research or referential web site or another great article on my second monitor. 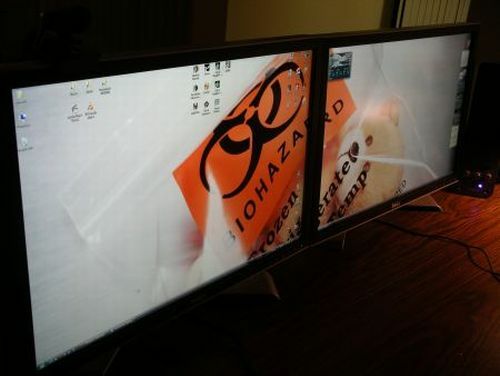 If you’re rocking a laptop, you just need to invest in an external monitor to go with your laptop. If you have a computer with one display, consider a second one – if you have the space for it, it can make a huge difference in keeping you from printing things that wind up on your desk so you can refer to them while you work on your computer, and it can make a huge difference in keeping you from needing paper on your desk at all – you have space digitally now that you can use. It’s a wonderful thing. The spring is coming, and a lot of people will consider a little spring cleaning. If you’re looking to make your workspace a little more organized and a little tidier, I hope these tips come in handy for you! It’s really impressive how sometimes taking the initiative to organize your paper, reduce your cable clutter, and overall just make sure your workspace stays tidy can stave off the big cleans and organizational projects that you’re probably dreading. Remember – do the little things when you notice them, and you’ll never have to do the big things. As always, let me know what you think! Leave me a comment below. images in this post courtesy of Flickr user pixelsonly (IMG_0812) and respective product pages for the products shown above at Amazon.